The world of mobile computing is getting better and better, but there are some limitations when dealing with smart gadgets running iOS or Android. The first thing is obviously the speed, which doesn’t even come close to what an average home computer can muster. Even my 5 year old test machine can outrun any mobile device without making so much as a dent in the cpu-o-meter. Speed-wise, at least when it comes to crunching fixed data like pixels or typed JS arrays, is nearly incomparable to the first approach. It obviously produce more code – but the benefits are just to good to ignore (roughly 4 times as fast). And last but not least, the “process” method should be inlined if possible, thats 50% of the point here. If you can avoid a secondary call – then avoid it, that’s how you cut down on call-stack overload and as a nice benefit you get a speed boost. #1 [29.09.11, 18:31]: Eric Grange pointed out (as did two readers on this page) that the same effect will happen if we apply FChildren.Count-1 and start from zero. That would be slightly faster to since we dont execute a continous subtraction of the index. A clear error on my part. #2 [29.09.11, 18:31]: Interestingly, the -1 trick was originally used for string processing (hence starting at 1) and has nothing to do with speed per-see, except that you save an “if FChildren.Count>0 then” in some languages. But this tiny advantage is indeed lost by the use of [-1] in the loop itself. Some basic compilers will execute the code even if FChildren.count =0. This is an old habit from the days of Amiga BlitzBasic programming. 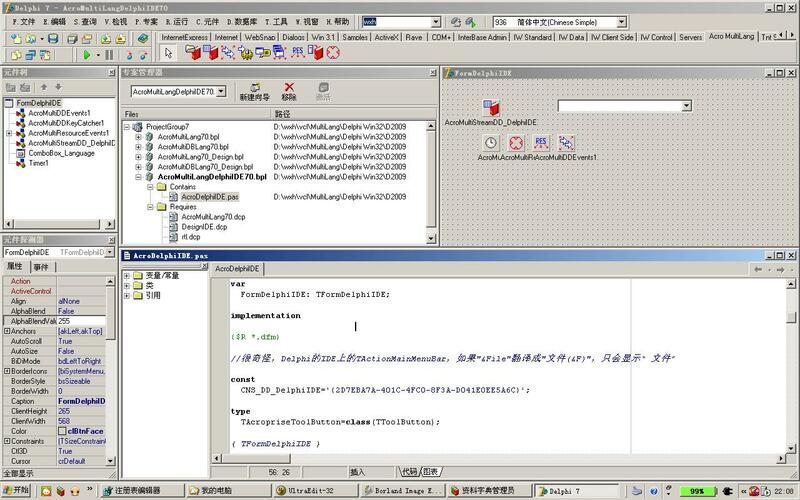 #3 [29.09.11, 18:35]: Also the “process()” call should only be concidered pseudo code. It’s the loop expansion that’s being demonstrated. Preferably you would work with the data directly at this point rather than call another proc, since the whole point is to limit the number of calls while speeding up a process. It’s not meant as a literal example, but as the bare-bones of a technique. Thankfully I found a “loophole”, I’ll document it later – but it wont make it into OP4JS because it’s basically a hack. You can use TW3GlobalStorage (one of our classes) as a mirror cache for the data – and it’s actually faster than creating, populating and moving a blob into the thread context. Although it does require initialization ofcourse. But i suspect that loophole will be closed in the next release. 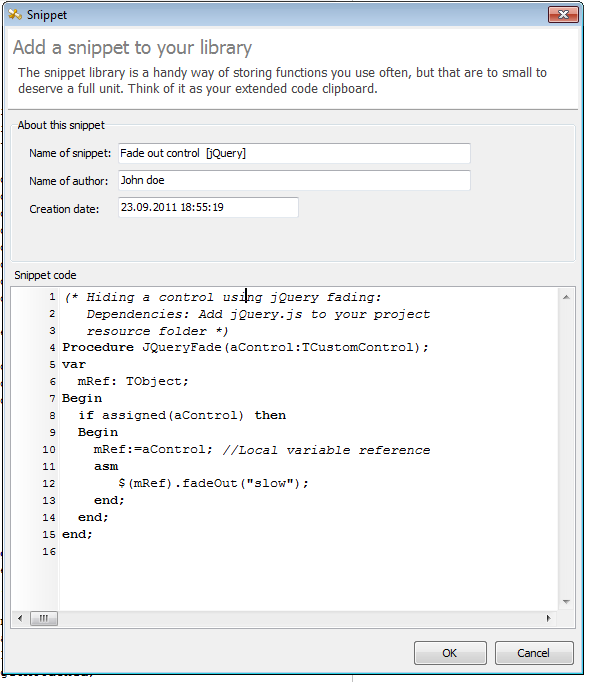 The OP4JS IDE (integrated development environment) aims to be simple, neat and clean. There are two reasons for this: First of all there is no point trying to catch up with products that have been in development for nearly two decades – and secondly because we don’t necessarily agree with the route some companies have taken with regards to their IDE’s. If you ask a Delphi developer what his all-time favorite IDE is, chances are he is going to put the finger somewhere between Delphi 5 and Delphi 7. The environments back then were responsive, lightweight and easy to work with. The interface was so intuitive that even without formal training it required little effort to learn how to use the it. For me personally Delphi 7 is the undisputed king of IDE’s with one exception, like XCode it was a multi windowed environment which is a feature that messes up your work-space. So for our IDE we turned the idea on it’s head. Since we are starting from scratch – why not use this opportunity to simplify things again? We have neither the time or manpower to catch up with the likes of Delphi, XCode or MonoDevelop. But what we do have is a keen eye on details and a desire to keep things effective. What are the basics of a good IDE? What do we need to get our work done quickly and efficiently? What do I need? If you are anything like me you probably have a desktop littered with notes, books, gadgets and coffey mugs. Once a week I give my desk a run over, clean out the thrash and try to organize my notes in a logical, easy to use fashion. I also have a couple of huge whiteboards with important things kept in check by magnets. Fact is, text matters. It is through words that we formulate and transfer ideas. Sadly the important of text and keeping our ideas organized havent really been implemented in most development environments. Delphi has a skinny “to do” list which is added to the project. I know a couple of people that use it – but let’s be honest: it’s pretty meager stuff. I mean, if I want to generate some form of documentation from my source-code, wouldn’t it be better to keep my notes in one place and my code in another? I’m not suggesting that we should stop commenting code, far from it, I’m simply saying that code-comments is more than enough for the code part. Adding documentation, ideas, who-did-what, credits and examples in the code is a bit excessive. A snippet is just a piece of code that you use often or that you found online. Handy enough to keep but not essential enough to deserve it’s own unit. I haven’t really used snippets before but after implementing it – it’s quite addictive (!) Whenever I go online to search for a solution or study a particular task – the snippet library functions as my extended clipboard, if that makes any sense. This week we are seeing some very cool ideas finally maturing onto the visual canvas. First and foremost: inline graphics. Under the traditional HTML paradigm resources such as images or soundfiles were always losely bound external entities. So before an image could be used it naturally had to download its content from a webserver or read it from a local file. But under HTML5 all of that goes out the window, because now you can embed your graphics as Base64 encoded characters. In short: transform your graphics into text and they can be applied anywhere. So today our TW3MenuListItem class got automatic support for inline glyphs. The default glyph is of-course the ordinary iPhone chevron picture, but when TImageList is done you will be able to apply just about anything. Since this is HTML5 you can also make use of your styles to add further “bling” to your elements – but we will leave that part up to you. Our job is to deliver a system with the basic iOS widgets ready – but object pascal style, which means easy to use, easy to work with and as little fluff as possible. Another cool feature that is now going through the test phase is the Angle property. All components that derive from TCustomControl have this property, and as the name suggests you can use it to rotate the control as you see fit. While it’s not the biggest feature in the world it does open up for a more colorful expression in the user interface. Want a yellow price banner over a product? Put a label on it, set the color and put -30 in the degree property. 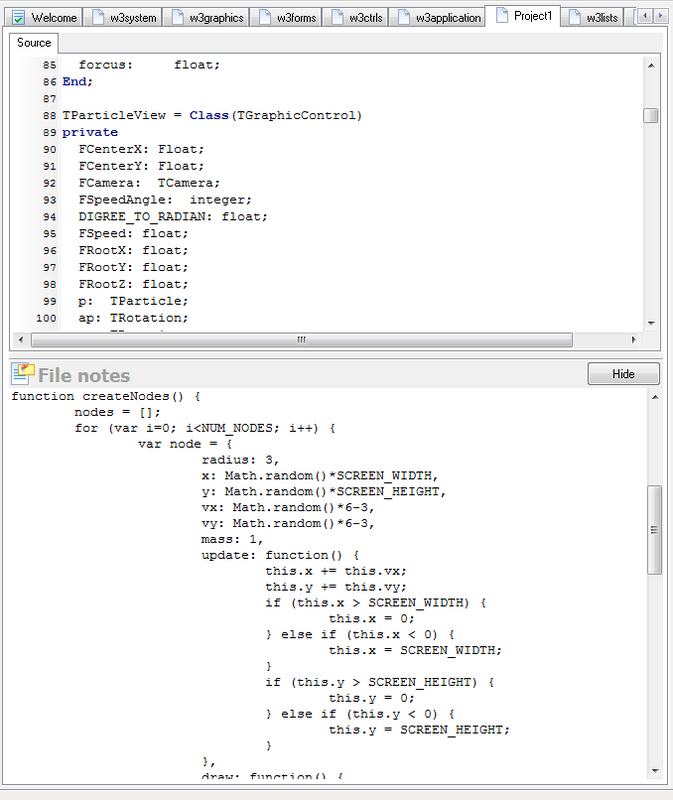 This feature is my favorite, but it’s also the most complex to capture under object pascal. Webkit allows you to define animation sequences, which can then be applied to a html element or a style. You then use a trigger rule to activate the animation. The cool part is of-course that most of these effects have hardware support – so they run smoothly and without any flicker what so ever.